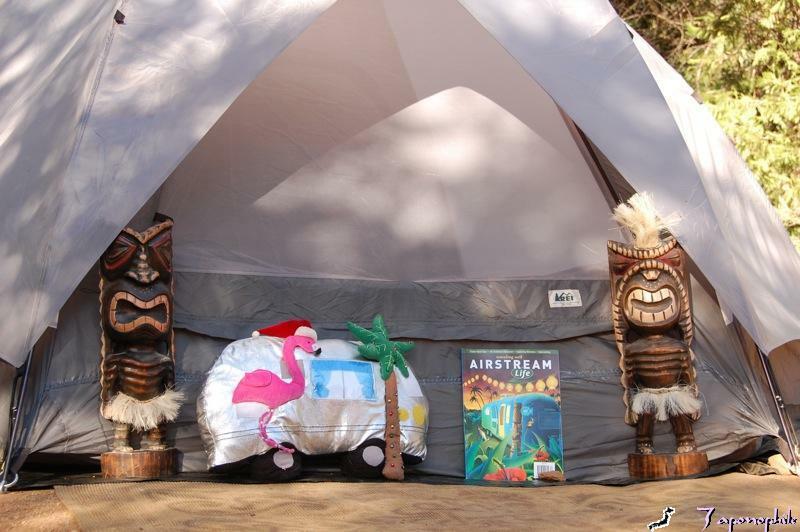 Is having a tent a contradiction to the mission of the Airstream? Isn’t that why we got the Airstream trailer? In the old days we enjoyed the adventure of camping, but sometimes it seemed more like work than fun. When we camp with the Airstream, we have just about all of the comforts of home, contained within a double-walled, well-insulated aluminum cocoon that is relatively easy to transport and set up. In the morning of our departure on our latest camping trip (to Julian, CA. 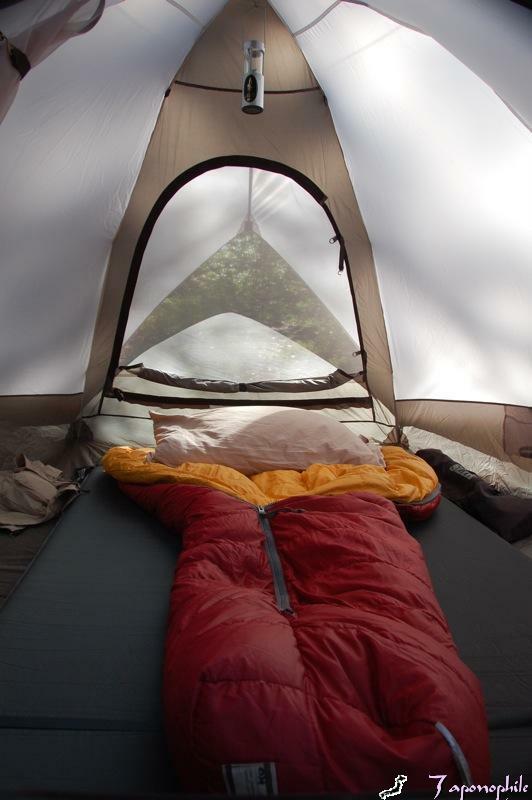 ), I read Rich Luhr’s timely and thought provoking Tour of America posting, “Tent economics“. Knowing that our destination, William Heise County Park, has wonderful tent sites established within the non-hook up sites that we reserve for our trailer, I scrambled to locate our 20 year-old REI tent, Therm-a-Rest pads and mummy sleeping bags that were collecting dust in the rafters of our garage. This silver domed tent looked right at home along with its mother ship in this setting. It also helped me make a connection with this historical setting in the Cuyamaca Mountains where Native Americas once lived in domed, thatched huts until displaced by the explorers and exploiters. We arrived just as Julian was about to celebrate Julian Gold Rush Days, and it was an apropos time to visit the Eagle-High Peak Gold Mine. 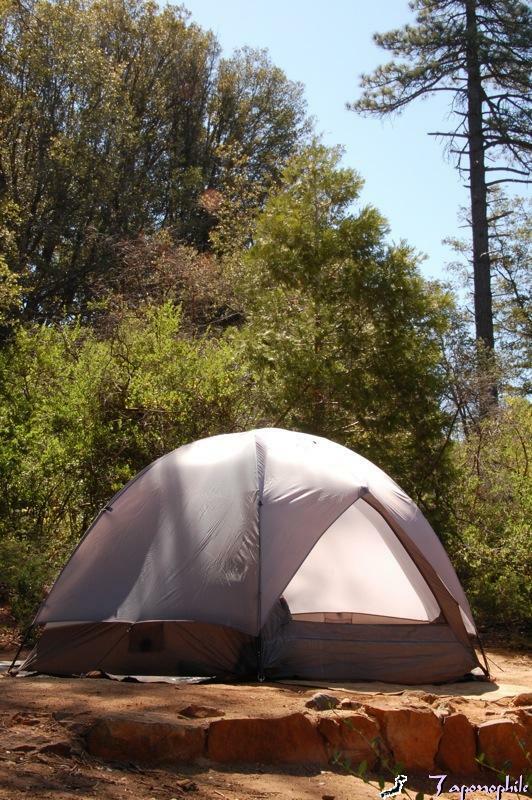 The tent also has a historical connection with our local area in the form of the Tent City in Coronado, which provided less expensive summer quarters for visitors to the world famous Hotel del Coronado and nearby beach between 1900 and 1916. A bit more austere than the interior of the Coronado tent summer quarters (linked above), our tent has comfortable mummy sleeping bags on Therm-a-Rest pads and a hanging candle lantern. 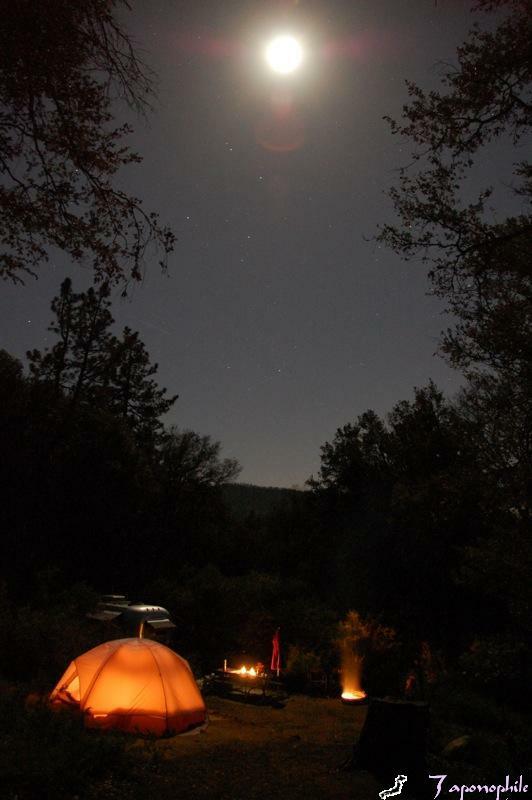 Beyond merely evoking nostalgic memories, the tent enabled me to be closer to nature and experience the magic of the night, the sounds of the crickets, the smells and sounds of the smoldering campfire, the howls of coyotes, the moon and twinkling stars shining through tree branches rustling in the wind, and the inevitable opening chorus of flitting birds at dawn. 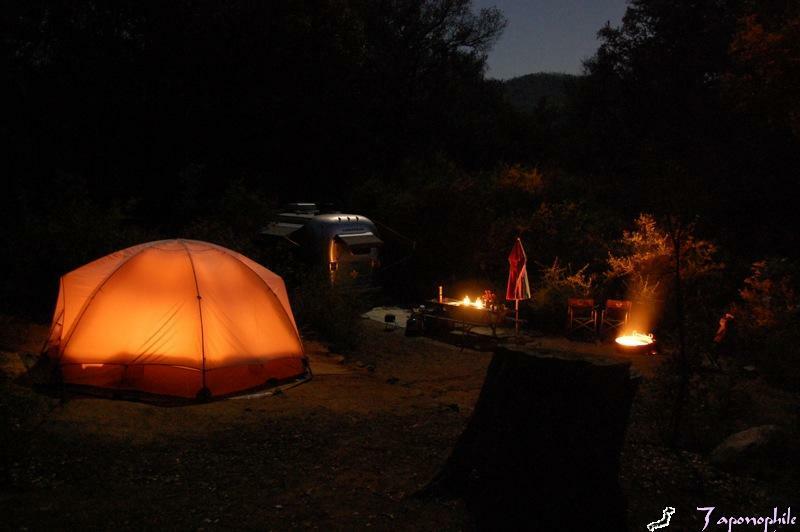 The tent offers variety to our camping experience. At times it could be an economic alternative, a change of pace, a guest bedroom, and a quiet spot for a moment of privacy, among other possibilities. It will be fun to continue to photograph the domed beauty of the tent and Airstream in a variety of settings. 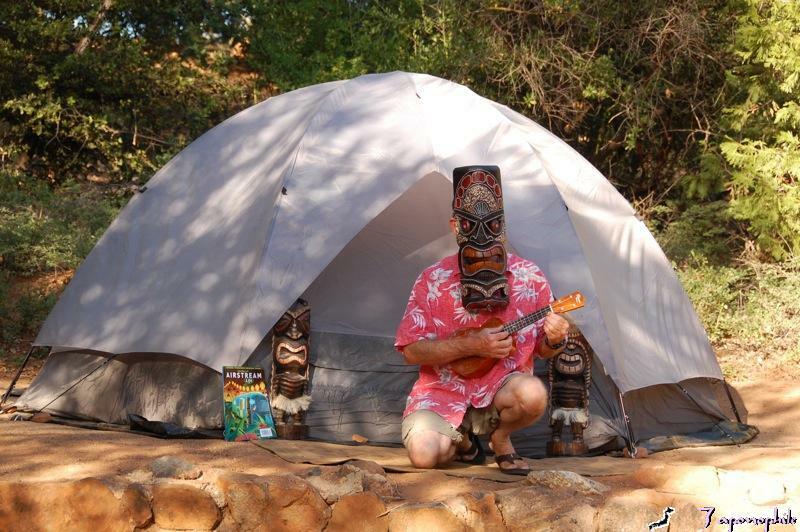 It could also be a place to play the ukulele. 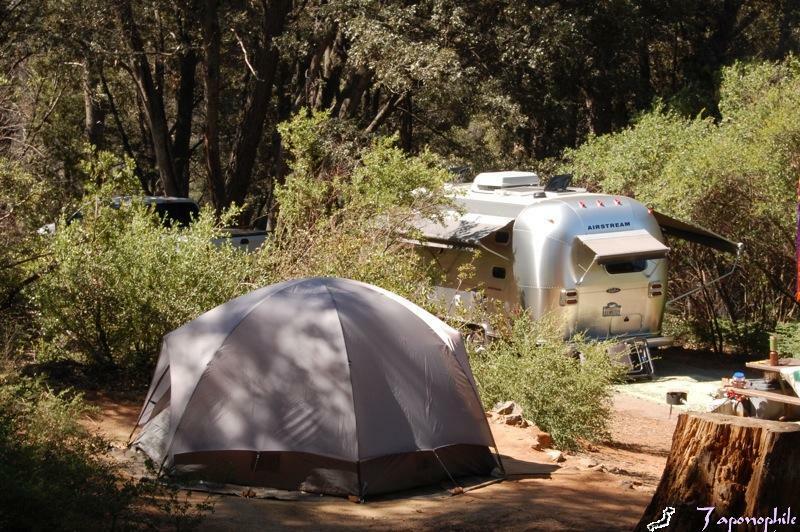 The bottom line is that the tent facilitates connecting with the environment, while providing more options for having fun with the Airstream. Eureka! Gold found in Julian! 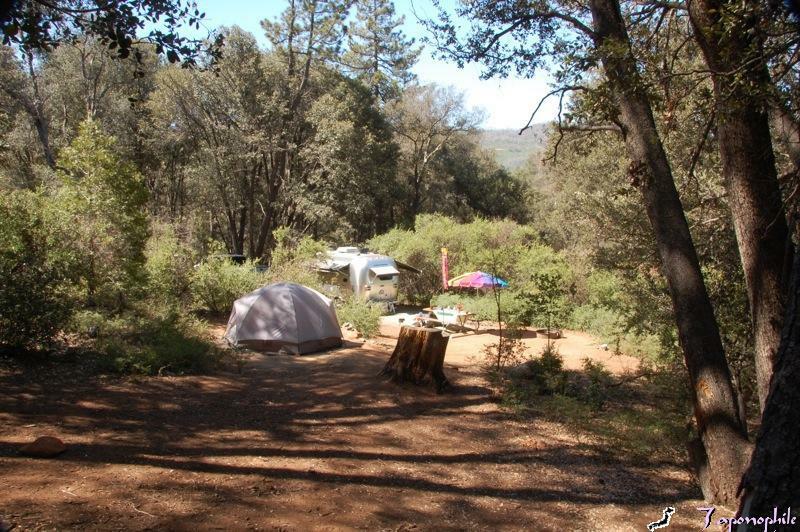 We returned to William Heise County Park, located near Julian, California, which started as a gold mining camp in 1870 at the northern end of the Cuyamaca Mountains and the southern slope of Volcan Mountain. At an elevation of 4,500 feet, the town is about 50 miles northeast of San Diego. We brought our Airstream trailer and REI tent (which will be featured in my next article) here, just as Julian was about to celebrate its annual Gold Rush Days. Native American Indians lived in the area 7000 years ago. 19,000 were estimated to be here at the time of the Spanish conquest starting in 1769. 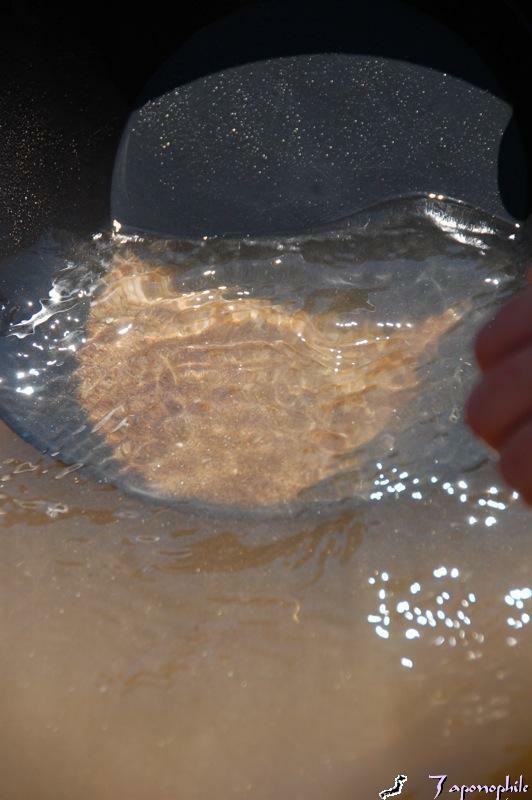 They lived in 85-90 seasonal campsites, following the seasonal temperature variations (as we do), and the ripening of major plants and availability of other food sources, they moved from the coast to the mountains and back. Less than 100 years later, the 1860 census lists only 2,807 Native Americans still living in San Diego County. In 1869 A. E. (Fred) Coleman, a former slave, was living with his Native American wife and eleven children near Volcan Mountain when he watered his horse and noticed gold glittering in the creek. 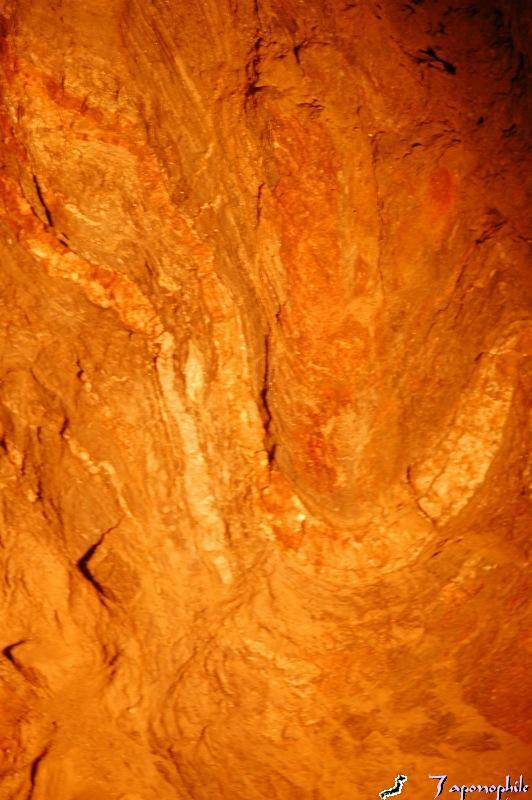 The trick is to follow the presence of gold particles upstream in hopes of finding the source of the gold. This is a form of placer mining. 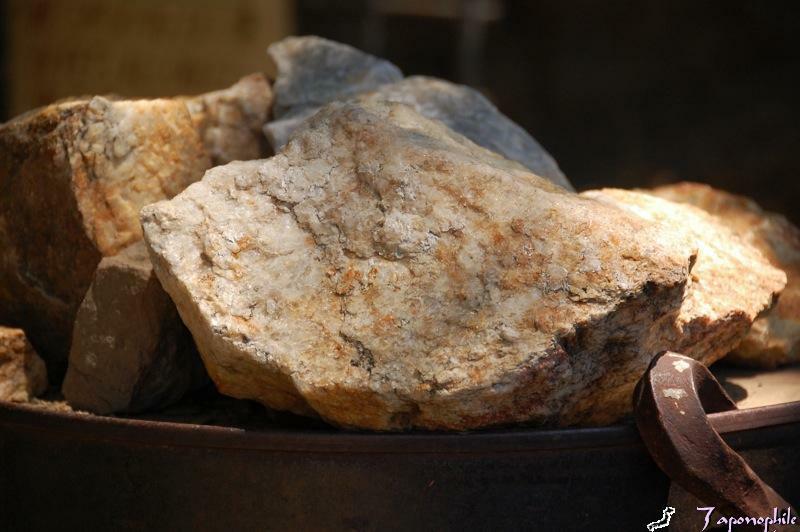 The following year, Confederates from Georgia, Drury Bailey, his brothers James and Frank, and his cousins, Mike and Web Julian, made the first gold quartz discovery. Drury D. Bailey then laid out the town and named it Julian City after his cousin Mike Julian. The gold rush was on, bringing a divergent mass of humanity, including Blacks and Chinese. Chinese workers, who had recently built the Central Pacific Railroad, came into the area in search of work. Some of the other miners resented their presence and killed them in fights. 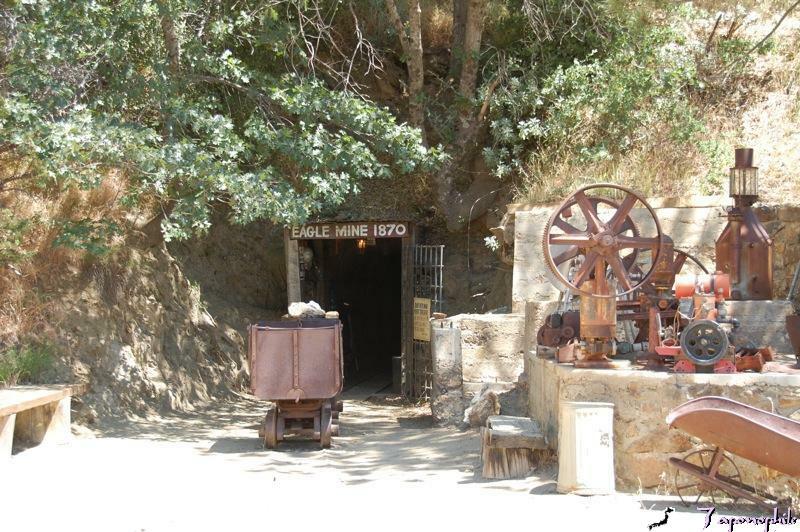 Two of the gold quartz mines registered in 1870 were the Eagle and High Peak Mines, which are currently open to the public. 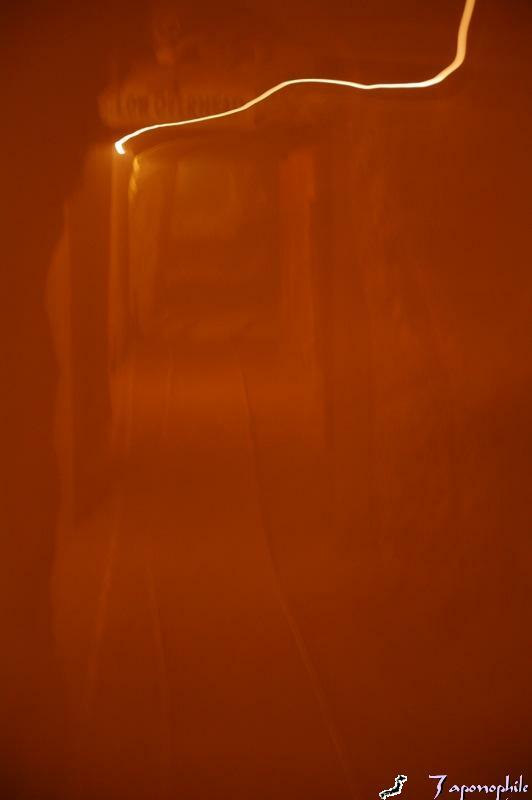 A trip to the mines is like going back in time. Here gold was found in quartz veins that formed over millions of years as sedimentary deposits were pushed upward forming our mountains, while immense pressures forced molten gold-bearing material up into tiny fissures as the earth’s crust cooled. As our tour guide took us in, he warned us to be careful not to bump our heads on the occasional low ceiling areas. We noticed that it quickly became darker, cooler and more silent. He pointed out the miners’ tools, maps, candle headlamps, and other gear along the way. Midway through the mine, he invited us to sit down on a bench as he turned off all of the lights to show us how dark it really was in there! After a pause, he seemed to be fumbling for his light and as I was about to reach for my Petzl LED Headlamp from my vest pocket, he turned on a pencil-thin beam of light from his laser penlight and directed it up to the ceiling as he pointed out the tiny specks of minerals that were floating in the air. He then told us how holes were drilled for dynamite charges that blasted out sections of rock at a time. 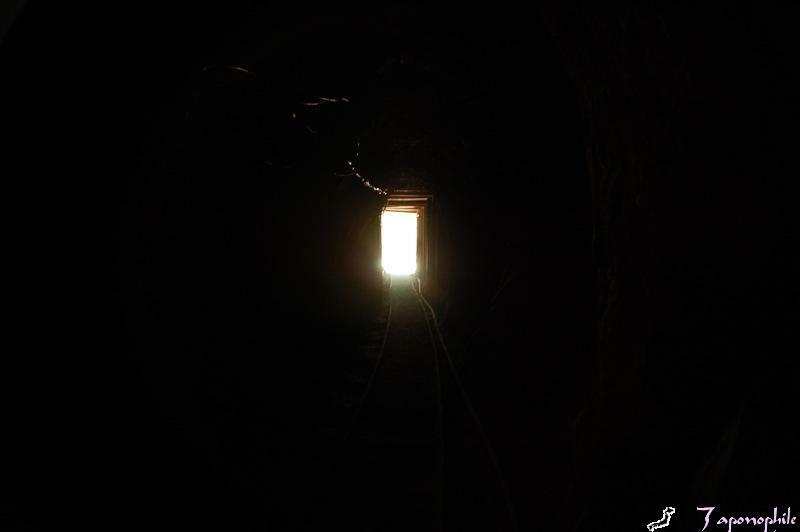 Just before the fuse was lit, the miners would hear the shout of “Fire in the hole“, and would run down and jump in a side hole in the mine and wait for the blast to occur, which was sometimes unpredictable if reed fuses were used. That were hauled out of the mine in carts on rails. 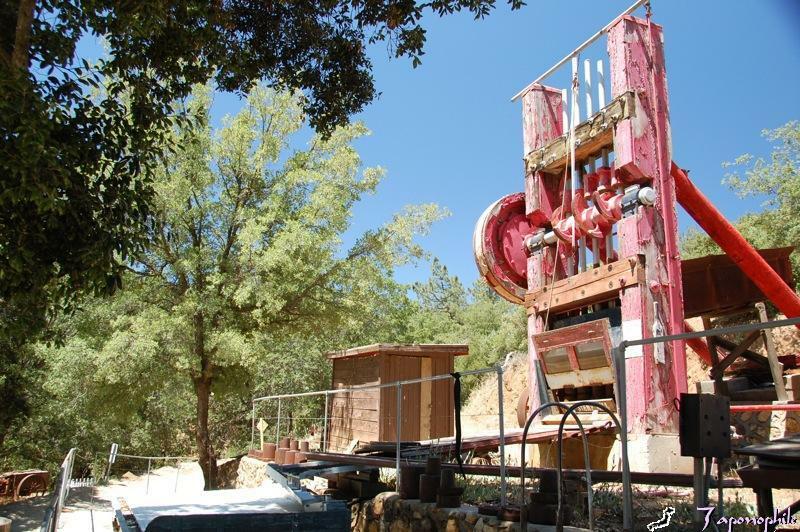 The quartz rocks were then taken to the stamp mill, where heavy steel weights (stamps) pounded day and night, pulverizing them into fine particles which were washed through screens and bathed in mercury and then cyanide to extract the gold. When gold was first found in California, some shouted “Eureka“, and it is now our state motto. Returning home from the shore, means it’s time to hose off the salt deposits from the trailer. It’s also the time for the trailer’s annual, big wash and wax job. This time, though, we knew it would entail more, and we’ve been preparing. 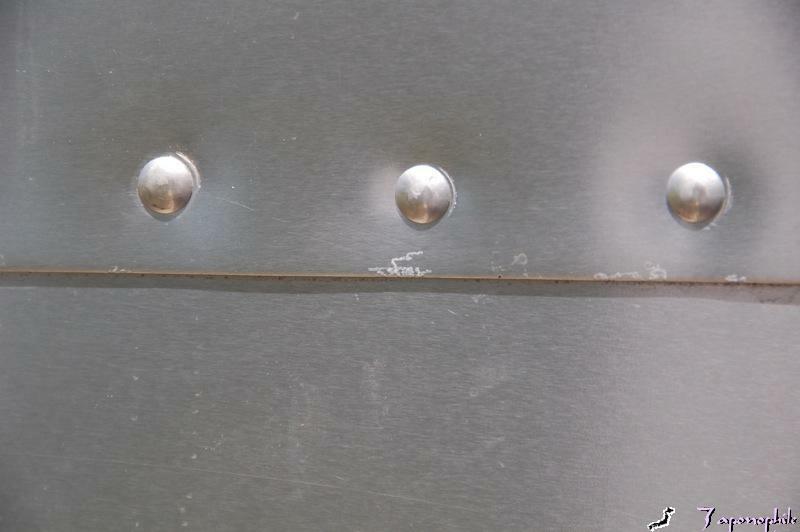 Ever since Randy (a fellow 23’2007 Safari SE trailer owner) asked the question, “Does anyone know what this is?”, on the Airstream Knowledge Sharing Forums, over a year ago, we’ve been watching for its appearance. 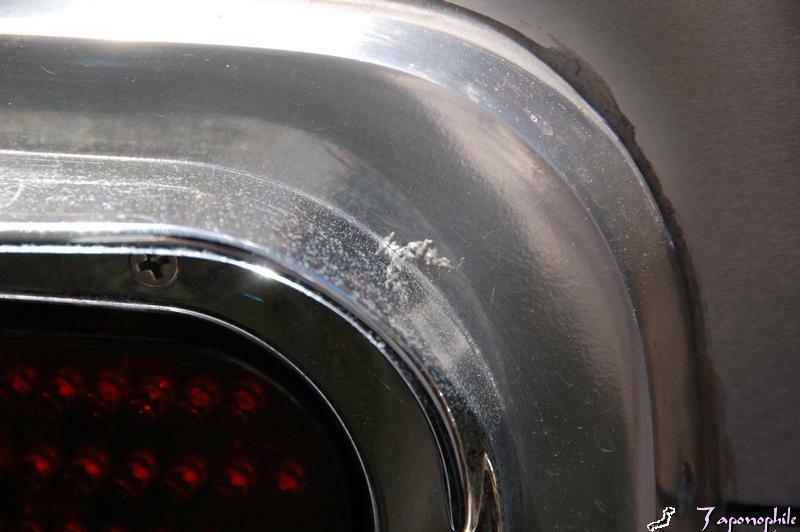 We’ve been following the Airforums’ eye-opening thread, “Corrosion problems with new Airstreams“, for a year now. We’ve been quietly holding our own vigil, carefully inspecting our trailer for the inevitable worm-like filiform to grow from the unprotected edges, rivet holes and scratches in the aluminum skin and burrow under the clear coat where humid conditions help it to thrive. Our filiform were slow to emerge, probably due to using a good wax last year, Meguiar’s Mirror Glaze, Professional Polymer Sealant, #20, as part of our wash and wax regimen. But emerge they did, white worm-like, thread-like filaments sprouting here and there along the belt-line area. Using Google search, I found interesting background information on filiform corrosion and watched how it grows. 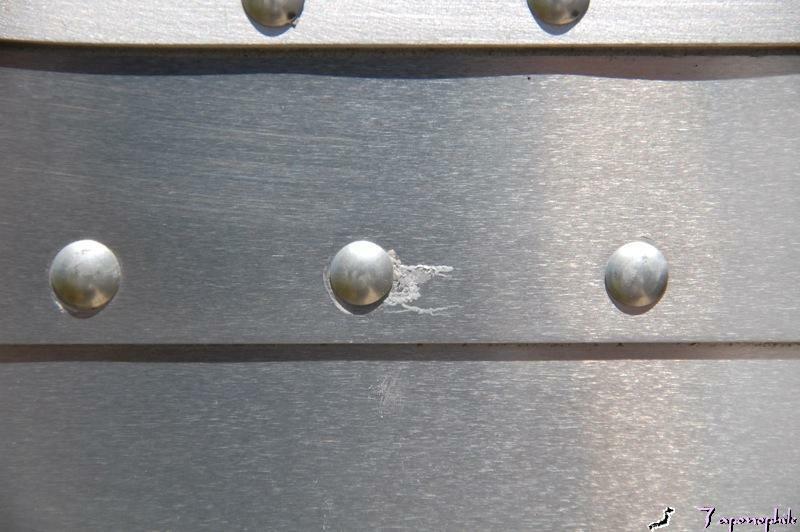 I am learning that corrosion is a threat to all trailers and filiform corrosion is a threat to all aluminum trailers with a clear coat finish. 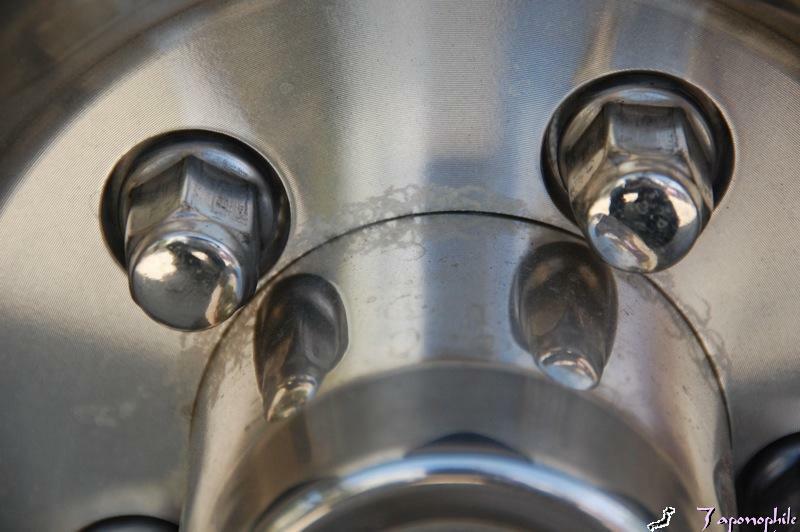 As of this writing, there are 29 fascinating pages regarding this filiform issue on the Airforum’s thread, “Corrosion problems with new Airstreams“, along with strategies to control this condition. This information helped us to select our interventions for the counterattack which coincided with our wash and wax job on our return from the beach. First, I washed the trailer with a good car wash and chose, Meguiar’s Deep Crystal Car Wash.
We chose and applied CorrosionX Aviation to the entire belt-line area, taillight bezels and wheel rims. I also applied CorrosionX to the stabilizing jacks, which were showing some corrosion. The following day, I wiped off the oily excess and sprayed on Boeshield T-9 (“Rust & Corrosion Protection, Waterproof Lubrication”, as stated on the label). I liked how T-9 dried, leaving a waxy residue. Meguiar’s Professional Sealant #20 was then applied and buffed. 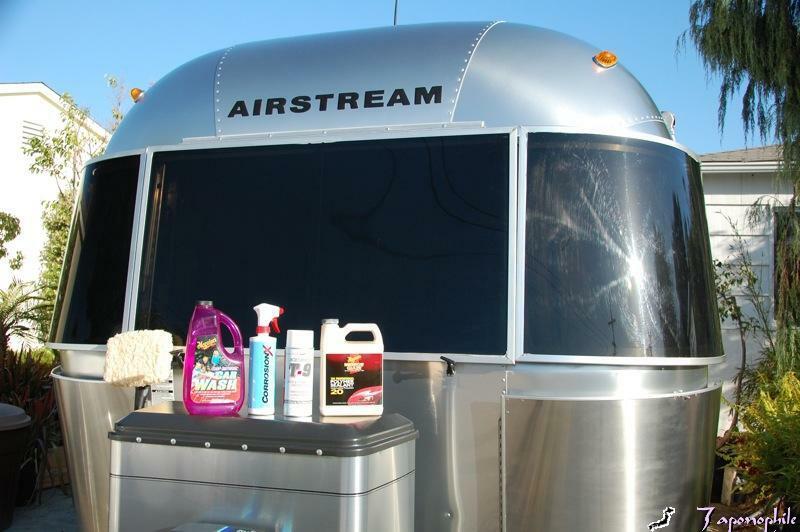 Read Randy’s experience with filiform corrosion and his remedy: he took his trailer to Jackson Center where the Airstream factory applied the Classic Beltline Trim. 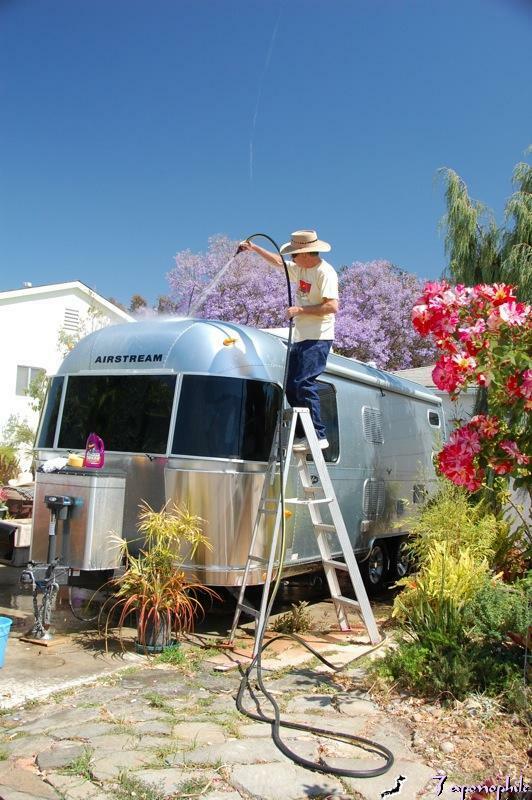 We’re hopeful that our interventions will be successful in protecting our Airstream trailer, while keeping it looking good.